Before you list your house for sale, consider a proven way to sell your house: careful home staging. Some positive aspects of home staging include less time on the market and better offers. And you should certainly consider professional home staging if you need a fast home sale. Home staging is part of preparing your home for sale. Staging centers on on your home's presentation to buyers and buyers' agents while showing off the characteristics of your home with thoughtfully placed furnishings and photos so that your home appears bigger and buyers can envision living in your home. Begin with the outside of your home, or your curb appeal. Take a fresh look at the outside of your house from the view of a passerby. What jumps out at you? What would've-been-eye-catching characteristics seem to fade into the background? 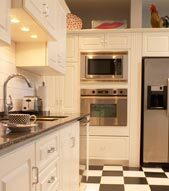 Acknowledging this assists us in determining what steps we can take to draw buyers from the street and into your home. If your house isn't the best it can look on the outside with touched up paint and bright greenery we'll need to tackle those as well. Follow the Curb Appeal Checklist and boost your house's final selling price. Could a buyer picture themselves enjoying game night in your living area, relaxing in your spa tub or studying in your home office? We want your home to welcome buyers and offer them a sense of contentment. We'll help you do this by recommending small improvements that highlight the features of your property. We'll suggest that you put out of sight anything that gives the illusion of clutter. Tabletops should be neatly arranged. Arts and crafts, souvenirs, family photos, and kids' drawings should get moved out of sight. You need to "neutralize" the house so buyers can picture it as their new house. We'll review each room of your home. We'll point out the pieces of furniture that should be rearranged, rooms that need new paint, carpet needing to get changed, fixtures that could use polishing, and any other improvement that can inexpensively be made to positively influence the sale. We'll make sure your house has mass appeal and that it's friendly, steering clear of "loud" or "can't-work-with" hues on the walls and furniture. And if you've already moved out, you can consider borrowing furnishings. The goal is for your home to look lived in as opposed to vacated. At your Open House, we're doing well if we're engaging the buyer's senses. Brightening up each room is critical, so we'll do things like draw back curtains and change light bulbs where needed to show off your property. Together we'll enhance the air of the house with enjoyable music to listen to while guests experience your home and ensure a pleasing aroma circulates room-to-room. We'll make use of cozy-looking blankets, and throw pillows on your chairs and bed. We want buyers to feel like your house is their future home. If you'd like to know more about home staging to sell your home quickly in Glendale, Arizona, contact us and we'll use our Glendale, Arizona expertise for the fastest ways to sell your house.